I've made soft pretzels before. I've been wanting to bake something pumpkin-y that wasn't pumpkin bread, muffins, or cookies. I often feel like my most creative recipes are born at night right before I go to bed. See, this is when I have the most creative cravings-- right when I'm about to go to sleep and can't make them. Does this happen to anyone else? Anyway, I usually ask Austin to write my recipes down in his phone so I won't forget about them. I thought of this one about two weeks ago. I had to do some recipe research, because I wanted to make sure these were good. Cinnamon can prevent yeast from rising, so I had to figure out exactly how much I could add so it would still rise, but have enough cinnamon flavor. Also, I don't like when soft pretzels are bagel-like. I don't want my soft pretzels to have rubbery texture! These are dang good, y'all. You can make the dough in a bread maker, using a stand mixer, or kneading by hand. Bread machine: Put all ingredients in the bread machine in the order prescribed by your instruction manual. Let it knead the dough and rise ONCE until doubled in size, then remove to shape. Mixer or hand: Combine water, yeast, and brown sugar. Let the yeast active for about 5-10 minutes. Add the remaining dough ingredients and knead with a dough hook for 4 minutes or by hand for 6 minutes, or until it springs back when you gently press your thumb into the dough. To shape: Divide the dough into 12 equal pieces and roll into a 18"-20" snake. Shape it as a pretzel. Watch this video for more information. To soak: Combine the water and baking soda. 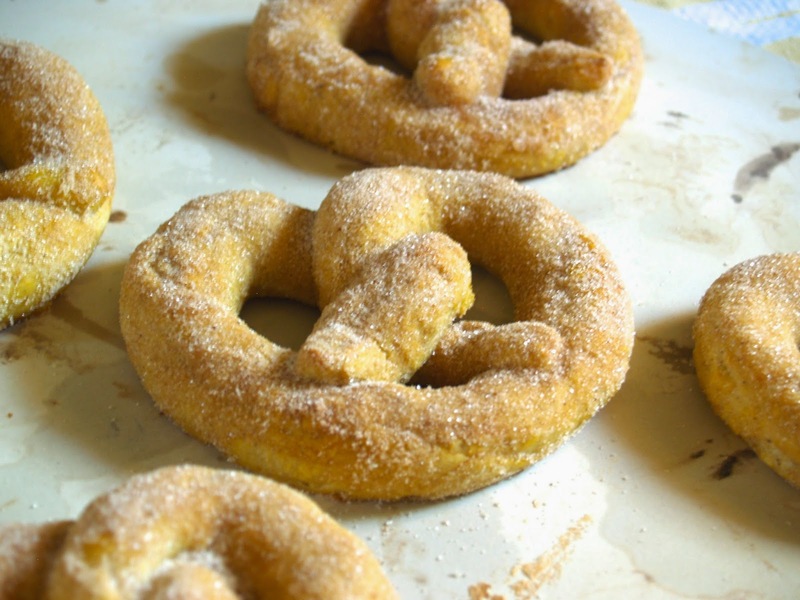 Quickly dip each pretzel into the hot water and baking soda mixture for about 3 seconds, then place on a cookie sheet lined with parchment or a silpat. To bake: Preheat your oven to 450 degrees. 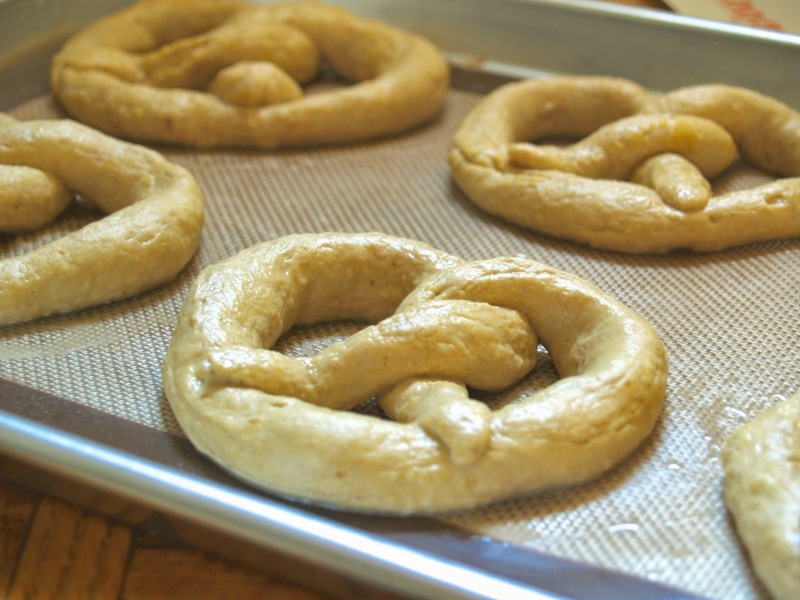 Let your pretzels rise on top of the oven as it heats up, about 20 minutes. Bake at 450 for 10 minutes, or until the tops begin to turn golden. 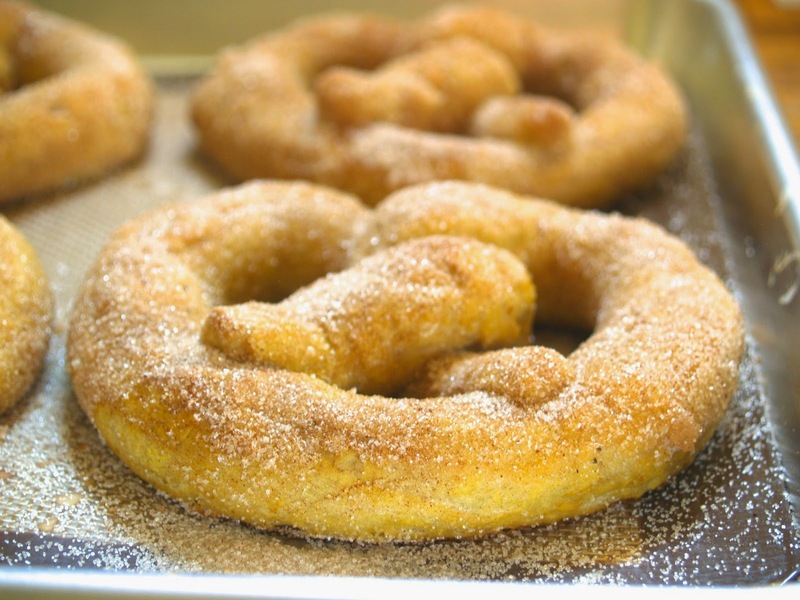 To top: Brush the melted butter on the hot pretzels, then sprinkle with combined sugar/pumpkin pie spice mixture. To make the dipping sauce: Beat all the ingredients together.